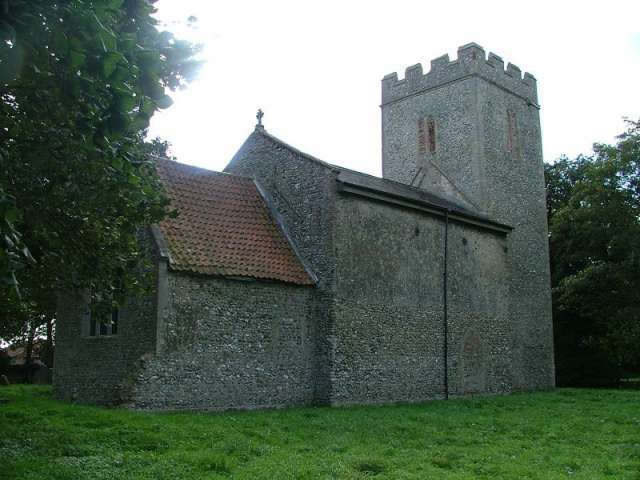 Cockthorpe has a tiny church on the lonely outskirts of Stiffkey, so it is not surprising that it has been declared redundant. Cordoned off within the perimeter fence of a WWII aerodrome, derelict for decades, it was finally thought worth saving, and is now in the loving care of the Norfolk Churches Trust. The pretty little graveyard is overgrown and tree-surrounded, and in an intensely rural setting, among fields, copses and small farms. All Saints underwent a comprehensive rebuilding in the late 15th century; only the chancel, virtually a lean-to shed, survives from an earlier era, but it has been seriously battered over the centuries since. From the south, the smallness of the church is jewel-like, almost perfect, with a tiny aisle and clerestory beneath the earlier tower rising above. This aisle has been dated as early 14th century, on account of the tracery in the window, but I think this window has been reset here later from elsewhere. Whatever, it is lovely. On the north side, however, there is no aisle, no clerestory, not even any windows; just a sheer blank wall, as if you had stepped behind a stage set. The lower wall is the original wall, the upper part a 15th century extension. Perhaps it was done temporarily, and an aisle was planned, to be followed by a clerestory. But none of it ever happened. The inside is delightful, simple and uncluttered, very much in the CCT manner. With so few windows this should be a gloomy place, but somehow it isn't; the dimness is earthier, more ancient. A St Christopher wall-painting, rediscovered in 1988, survives opposite the entrance; you can just make out two kneeling figures near the bottom, who were probably donors. 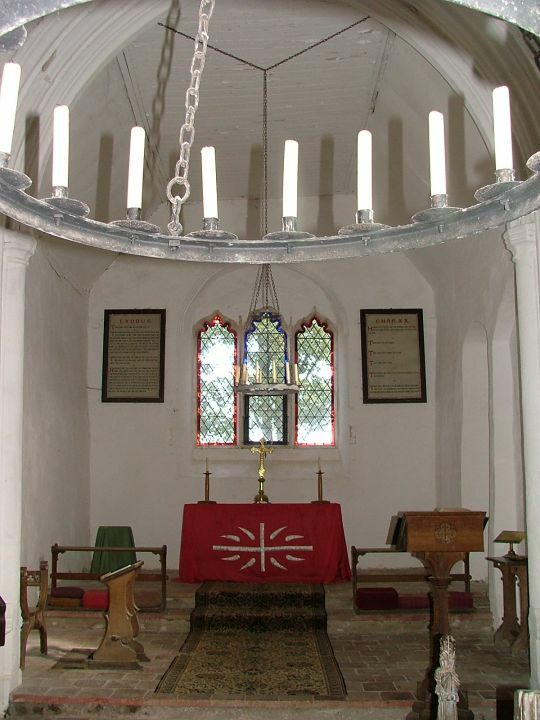 Cartwheel candelabra (there is no electricity) hang from the nave roof. 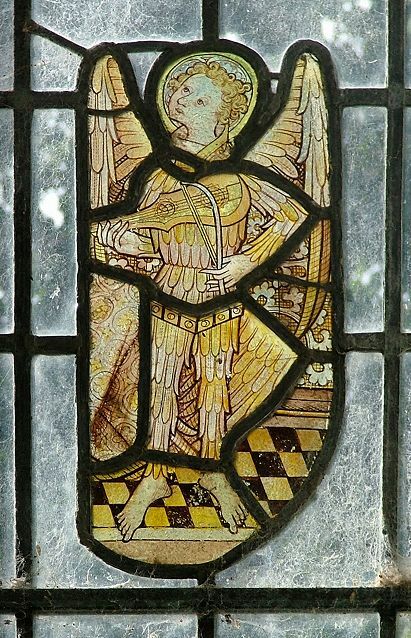 Best of all, there is a stunning angel musician in medieval glass reset in the west window beneath the tower. Curiously, he appears to be left-handed - or has the glass been inserted back to front when it was reset here? As I gazed up at him, a blackbird stuttered outside the open door, and then broke into song. It was heart-stopping. The memorial is of interest. It recalls Sir James and Lady Barbara Calthorpe. Dame Barbara was a daughter of the Bacons of Hessett in Suffolk. The Calthorpes had 14 children together, unremarkable for a ruling class family at the time, but it was thought worth noting here that by their severel marriages and issues the ancient glory of the name of the family... did reflourish and is dilated into many of the best houses in the country. And, as if that were not enough, Barbara, surviving her husband by a quarter of a century, was much comforted with the sight of 193 of their children and their offspring. No wonder she was happy to have exchanged this life for a better in 1639. This church is so simple, so homely, such a sweet antidote to the undoubted splendours of nearby Blakeney and Cley, and a place to lift the heart after the gloom of neighbouring Stiffkey. I liked it very much.